Being ambulatory one can never comprehend the challenges encountered by those physically disabled. While society tries to accommodate those physically challenged either through genuine altruism or simply to comply with laws and regulations, efforts often fall short. In my short time bound to a wheelchair I have encountered numerous frustrations with those claiming to be wheelchair accessible. The problem is often not discovered until on site and perhaps too late to turn back or make alternative arrangements. Time is wasted, frustrations mount and damage can occur to both the chair and the environment. automatic doors that are frequently broken. The alternate entrance may at the top of some stairs and not an option for a wheelchair. Automatic doors that are too narrow to accommodate the width of a width of a wheelchair without skinning ones knuckles . Doors that open into a narrow vestibule or breezeway and then take an immediate ninety degree turn to another inner door. Difficult if not impossible make the sharp turn. On entering one door, it starts to close before the inner door can be opened - smashing into the chair with the wheelchair often being lodged between two half open doors - unable to move forward or backwards. Power closers on outer doors meant to keep the weather out or inner doors such as on washrooms, meant to assist the disabled by automatically closing the door for the user. The power mechanism (electric, pneumatic or mechanical-spring loaded) is often so powerful that it becomes a challenge to hold the door open wide enough and/or long enough to get through. Often becomes a fight with the door before getting whacked by it or having it scrape along the chair as you pass through. Regardless if you're right or left handed, if using an electric wheelchair with a joystick controller, the controller will be on the wrong side either on entering or exiting. You become a contortionist using the controller with one hand while reaching over your own head with the other hand to attempt to keep the door from crashing into the chair. Both the chair and door can be damaged in the process. In a manual chair the door slams on the hand propelling a wheel. Both hands are needed to propel the chair in a straight line and cannot be used to hold the door away from the chair. Well meaning but misplaced automatic door actuator switch. Door is against an adjoining wall so it can only be approached from one side. The door actuator switch is located so close to the door that when approached to press it, the wheelchair leg rests protrude in front of the door. The door on opening hits the leg rests and on sensing an obstruction, it's safety mechanism triggers it to close prematurely. A slapstick comedy routine ensues of pushing the switch and trying to back out repeatedly before the door strikes the chair. In the end I only escaped by backing up to the switch, pressing it, then wheeling about at full speed to pass through before it timed out and shut again. I actually encountered this situation in a hospital that specializes in spinal cord injuries! My doctor's office has narrow doors and hallways. I cannot even get into an examination room to have a dignified private consultation. Modern architecture and construction is functional, attempting to maximize the number of rooms in a given space which also maximizes the developer's price. Easy to suggest just changing doctors however in Canada it is currently difficult finding doctors accepting new patients - leaving one that you have developed a rapport with . Older buildings are more spacious but often are not wheelchair accessible by virtue of the era they were constructed in. 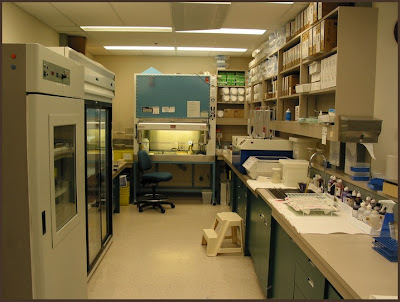 Newer buildings are intended to be wheelchair accessible but hallways and rooms can be small to maximize space utilization especially with the current trend to go 'green'. Stores, theaters, churches and most recently, a funeral home (etc.) that claim to be wheelchair accessible but can only be entered if the proprietor comes out to lay down a ramp or have you enter through the loading dock. Trouble is, if on your own how do you get a hold of the staff/manager/proprietor etc, if you are stuck on the outside and they're inside? Well meaning but may not always be the most dignified way to gain entrance. Store aisles that are frequently too narrow to start with, display racks that protrude into the aisle, contents that protrude which the chair can snag and pull over, destroying the display. Shopping carts, stocking pallets, dollys and movable step-stools/ladders which are abandoned, askew in the aisle, thereby blocking them. Perhaps most frustrating of all are people who block an aisle, perusing the items, chatting with staff or companions or just loitering while the spouse shops - when rolled up to with the wheelchair they look down upon you with a blank dumbfounded stare - like a deer caught in the headlights refusing to move. Sitting there at their knee level, repeated "excuse me's" fail to get them to step aside and let you pass. A look of confusion or sometimes even indignation follows with your inconvenient request to pass. Are people stupid or just rude? Cut off, stepped in front of, passed by in a turnstile door and just plain ignored like a non-entity. I am no longer considered a person but rather an obstruction. Happens more often than I care to mention. First off, after the medical reality, one is only as disabled as you yourself and those around you allow you to be. If changes are made so that I don't have to stretch, reach, bend or navigate to perform my duties, I won't. Maybe I'd like to. I feel this is different from the situations I mention earlier in this post. Automatic or assisted doors, the size of hallways, the placement of actuator switches and the behaviour of people towards the disabled frustrate me as general problems, which should be regarded as problems for people with a wide variety of disabilities, often more challenging than mine. In my workplace, I think an initial assessment of what might constitute physical barriers preventing me from doing my job and what might be safety issues, would be all that is necessary. Other problems could be dealt with if and when encountered. I would far prefer to figure out how to do a task as it has been set up and as performed by all my co-workers rather than to be catered to and have exceptions to the rule made to accommodate me. In other words - let's see if a problem actually exists before we start changing things!!! 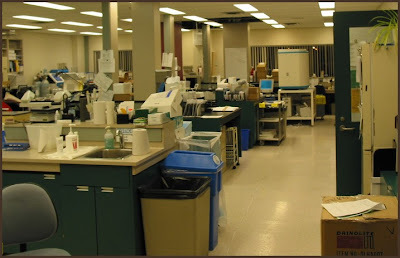 Working in a hospital laboratory, clutter seems to be inescapable. Work always expands to fill the area available. 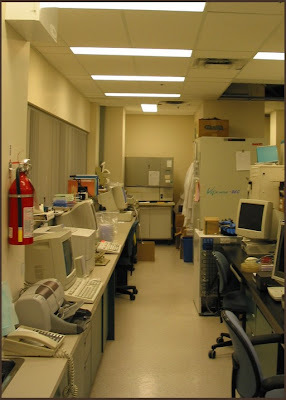 Every laboratory I've ever worked in was filled to capacity with equipment immediately on occupation. There is little room for expansion and items are often stacked upon items. In my situation, aisles are narrow, biological discard bins hover around the floor, migrating to where needed. Colleagues sit on the edge of their desk chairs to lean into their work with the rest of the chair projecting into the middle of the aisle. When co-workers stand up, the chair is usually abandoned in the middle of the aisle until their return. Pushing the chair back in under the bench is only common courtesy towards all workers but of course it often falls victim to human nature and the hectic workplace pace. Minor nuisances and all forgivable. 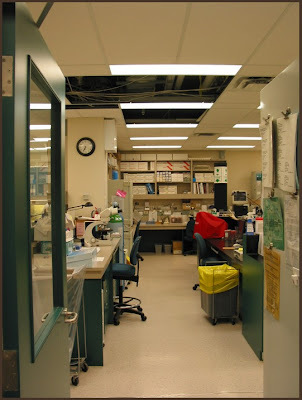 Still, the laboratory workplace is a minefield of obstacles when navigating the floor. All other issues I believe I can deal with without additional aid. As I can stand and reach, no item is beyond my reach and need not be moved down to chair level. Below are a few pictures of the floorspace I have to navigate with my wheelchair to maneuver around. 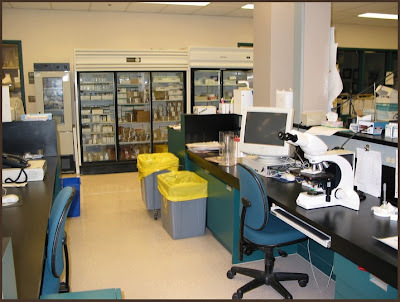 When in their proper place, these items shouldn't present themselves as obstacles but as many items slide or are on wheels, they tend to migrate around the room where needed and often are left abandoned or protruding from the workbenches. A minor inconvenience but does slow things down particularly if I'm carrying items in one hand while operating the joystick with the other. Have to kick things out of the way or free up one hand to deal with the obstruction. Where others can turn sideways and squeeze through, I cannot. Colleagues have been very accommodating, but this is the real world and chaos often triumphs over order. Regardless, it's great to be back!